I don't like things up tight around my neck. For example if you put me in a polo neck I'd be clutching at the fabric and panting like a rabid dog and making generally distressed noises within seconds. Almost every top I wear has a V neck and at work I am usually seen in one of my thirteen 3/4 length sleeved V neck knitted jumpers from Evans. All different colours, but some more different than others. But then again I don't like being cold on my early morning walks to the bus stop and I like to give my throat a wee bit of protection otherwise no speaking (I speak all day at work) or singing (if I refrain from singing for more than five mins, check for a pulse). 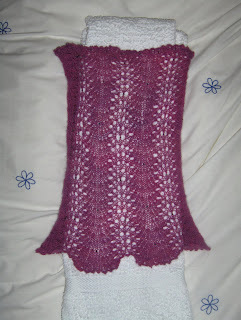 So, here's my pull-on pull-off cowl, made to Rosemary Hill's Ice Queen pattern in Knitty Winter 2007. Nan of Stitching Time first recommended this pattern to me last year. Rowan Kidsilk Haze is the yarn called for, but I scored some lovely hand dyed Alpace from my knitting buddy Alice in a recent swap shop, and thought it would fit the bill. 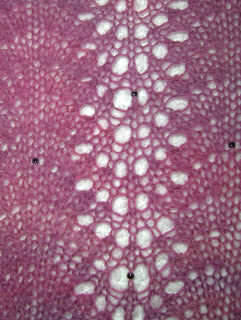 It's a lovely semi-solid yarn which was a delight to work with but a total nightmare to ball up. That all seems like ancient history now as I admire the finished object. I used some Jaeger beads left over from Swallowtail. There are dozens of fudges in this, it seems that every time I took a photo I saw a new imperfection but it really is no big deal to me at all. I would like to show you how it's a lovely cozy collar which reaches down into the top of your coat and makes your shoulders snug, while remaining nice and loose and comfy at the neck. Or pulled up over your head to keep the wind out of your ears. But outwith working hours there is just so little daylight at the moment. And this coming from someone who can finish at 3:30 some days. Hopefully I can show you some action shots in the near future. Snap! I hate things choking me, too. Fortunately, my climate is more forgiving of my parade of V-necked, 3/4 sleeve tops. Lovely neckwarmer. I like V neck - since I'm short and not slim - V neck works best for me! Also, this winter will definitely be cowls time since they dominate scarves!